Intuitively crafted to maximise breathtaking north facing Brisbane River panoramas from its premier position, this prized contemporary residence is impressive in design and scale. Situated on a spacious 589m2 block with 11.2m absolute river frontage is an exquisite showpiece of versatility and sophistication. 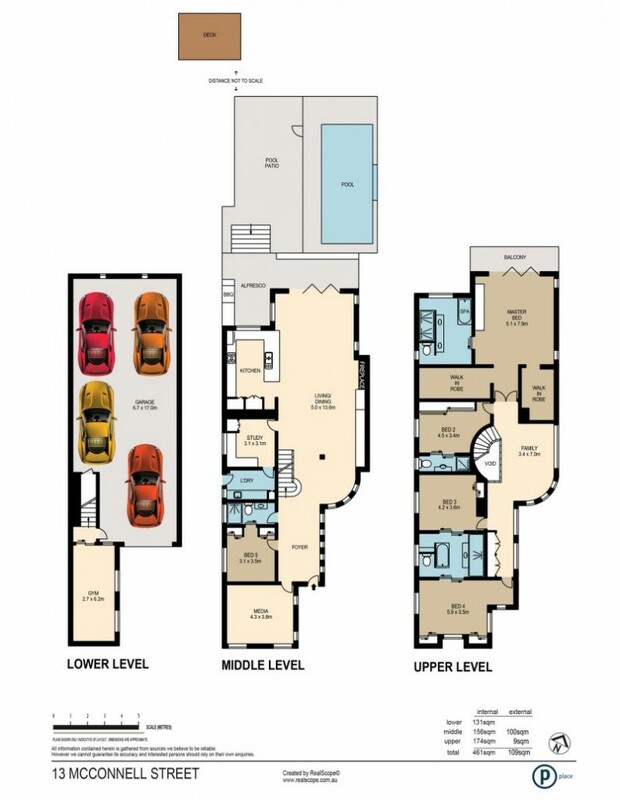 This architectural creation features a practical open concept layout incorporating high ceilings and an abundance of natural light, the separation of living spaces and accommodation is fused to create a relaxed entertainer's lifestyle across three levels assuring privacy and comfort for the entire family. A gourmet delight, the modern kitchen is sure for cater to discerning chefs with its unique layout comprising a range of quality European stainless steel appliances, array of stone benchtops, sleek white cabinetry and soft close drawers. Uncompromised in quality, surround sound throughout with intercom and security systems; ducted air conditioned living and dining areas open through exquisite glass bi-folds to the outdoor alfresco entertaining terrace and magnificent glass framed swimming pool leading to the private marina berth, the perfect complement to riverfront lifestyle. Dressed with lavish contemporary flair, the five bedrooms include a sprawling parent's retreat capturing enviable vistas of the river set with walk in robe, private ensuite and deep spa bath. Two family sized bathrooms, powder room, a dedicated study/office, media room and additional family room showcase the clever use of space while an impressive underground gymnasium and a four car garage cater for every need. Desirably positioned in the heart of sought after Bulimba, just 3 kilometres from the Brisbane CBD, outdoor leisure enthusiasts will be captured by the vast stretch of the river, while the cosmopolitan delights of Oxford Street present immense family appeal. Within easy reach of Ferry and CityCat terminals and bus stops ensuring an effortless commute to the CBD and surrounds where quality primary and secondary schools are located just minutes from the driveway. Acquire an enviable stretch of the iconic Brisbane River and indulge in blissful vistas extending over New Farm and Teneriffe. Register your interest today!